A rare find - updated 2/2 with den and end unit villa in Riviera Club Village at Longwood Run. 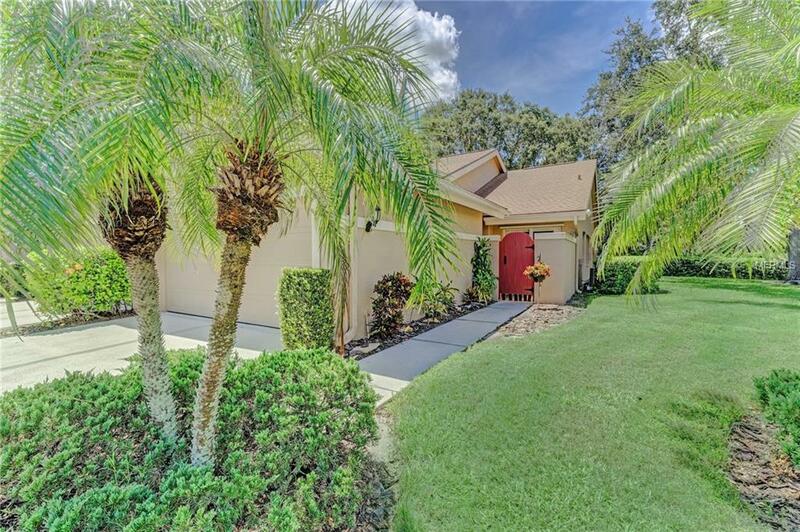 2 car garage, private courtyard, and year-round Florida room. Enjoy a relaxing maintenance-free lifestyleno yard work! As you enter this bright, open floor plan you with be surprised by the high vaulted ceilings throughout, skylights and architectural details. Split bedroom plan provides privacy for owners and guests. Kitchen has been updated and also has breakfast nook. Dining room and Living room offer ample space for entertaining your family and friends. The den has double pocket sliding doors and vaulted ceiling with can easily be used as a third bedroom for your guests. The bathrooms have been updated. New A/C in 2017, hurricane shutters, new appliances and remodeled kitchen in 2017. Longwood Athletic Complex is right next door with 18 lighted courts, swimming pool, fitness center. Longwood Park is just a block away with playgrounds, picnic areas and community center. Minutes to beaches, downtown, SRQ airport, Lakewood Ranch, several golf courses, shopping and Benderson Park. Schedule your showing today and start living the Florida dream!